Greetings. A great weekend. 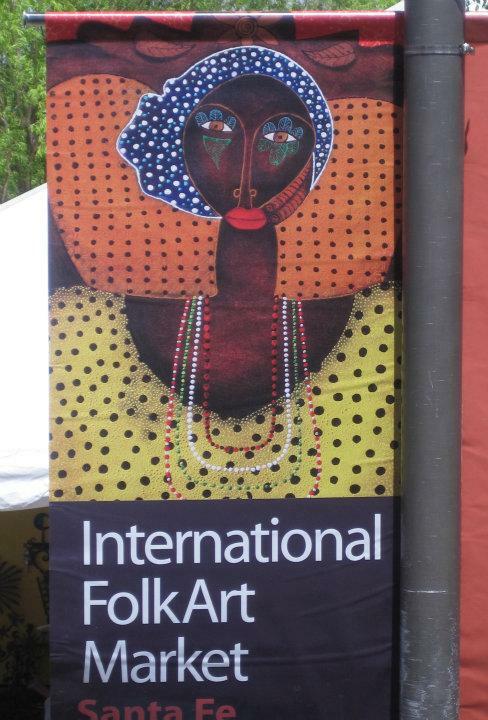 On Saturday we went to the International Folk Market on Museum Hill just a couple of miles from our condo. This is an unbelieveable event. Almost 200 artists from 90 countries gathering for three days and selling unbelieveable art and crafts. Lots of eye candy for me. Much of the money the artists receive from the sale of their goods goes back to their villages, often the main source of income for all the residents. In addition,, there are musical performances, everything from African throat singers to the plink plink of Asian stringed instruments. And, of course, there is food that is supplied by local vendors. Truly a multi-sensory event, appealing to the eyes, nose, ears, taste and touch. On Sunday, we went rafting on the Chama River, just north of Abiquiu, home to Georgia O'Okeefe. We had been to the area last year, to visit a Benedictine Monastary located at the end of a 12 mile gravel road, along the river. It is one of the most beautiful drives in the state and we vowed to come back this year and see it from the river. We booked with a local rafting company who took care of everything, tho we did need to help with some rowing. Our 87 year old friend, Don Campbell, whom I met in China about ten years ago, went with us. This is more about scenery than excitement with no rapids with a grade above a 3. The river is very low and by early August, is no longer passable, especially with the draught conditions. There has been some relief, thanks to the very odd front, moving east to west, that dumped rain all over the southwest. The temperature dropped 25 degrees the day after our rafting, to a very cool 63. The rain helped but was very sporadic. Our friend Jim Duncan, amateur meteorologist, said that the gray, overcast conditions, which you can see in some of the photos, are more typical of a winter snowstorm than a summer shower. Today we traveled about an hour south and played golf with Jim at Pakko, a very hard course, with the women's tees at 5700+. Do not believe that your ball goes farther at these higher altitudes. Afterwards, we drove up to the top of the Sandia Mountains, 10,000+ feet. One of the few mountains in the US you can literally drive to the very top. On a clear day, you can see almost 100 miles. We then stuffed ourselves at a local Mexican food dive, Dona Carla. You know its authentic when they have calves tongues and pig heads on the menu. This is pretty typical of how we spend our time, with a bit of shopping thrown in between. Marfa Pig heads ? Oh my. Elise Hi Julie! Loved the pictures of that market! What kind of bird was that? I can't believe the gorgeous colors! How much stuff did you buy? It sounds like you are really enjoying the area again. Love the blog! keep it up. I'll keep checking it from time to time.